We need to upgrade and refurbish our sewing room with better equipment to enhance the production and our training. A modern and versatile software system embroidery machine with built-in designs will enable us to produce exceptional embroidery work in a few simple steps. This will facilitate designing more attractive, creative and high-quality products for sale. Our beneficiaries will be able to learn how to set up the machine, select and create designs and produce products that can compete with the others available in the market. The profit will help us to maintain our activities and to pay a salary to our beneficiaries. 100 people with disability have benefited from our centre. Some of them came to us with low social skills and not being able to follow simple rules. Nobody wanted to employ them. We help them to learn skills and to find employment. 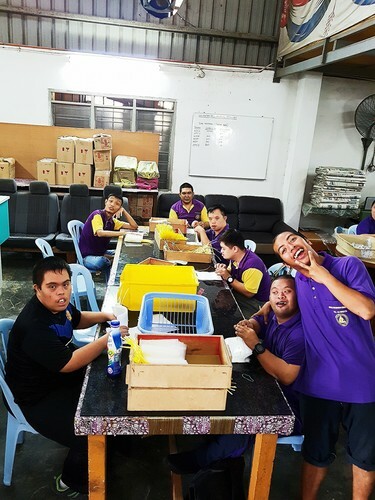 We also have sub-contract sewing projects from factories like BENDEN, EWANTA Sdn Bhd, Lipson Industries and Hospital – our beneficiaries can work making pillowcases, patchwork blanket and repairing hospital Taiping uniform etc. Donate now to help empower disabled adults. Give disabled adults a chance to have a job! Hope more people could get help.